July 6th came and went, and the Nats signed their #1 overall pick without too much fanfare, giving Mason Denaburg a nice bump over his slot value and wrapping up the 2018 Draft Class. Here’s a table of the 29 players we successfully signed, with known bonus amounts. The MLBpipeline Draft Tracker is the most up-to-date resource for this data now that Baseball America has taken most of its stuff behind a paywall. Of the 16 arms, 4 were relievers in College and are (presumably) already routed to that role in the pros. As of this writing, two guys have already been double promoted to Hagerstown; 11th rounder Frankie Bartow, UMiami’s closer this past season, and 5th rounder Cage Ganning, OF from UCLA. A few of the lower level bonus figures have yet to be disclosed; i could see Cole Daily getting a $125k bonus or near to it since he got bought out of his senior year, but the rest of the players w/o known bonuses were College Seniors who probably each got the same $3,000 bonus that other College Seniors got in rounds 20 and up. As of this writing, 2 have yet to be assigned, 15 went to the GCL, 9 went straight to Auburn, and 3 played a week or so in the GCL before getting to Auburn. Verdict on this class overall: I like the fact that they threw out a ton of max $125k bonuses in the rounds 11-20; that certainly wasn’t the case last year and it may have bought them some good players. I’m ok with Denaburg as their 1st rounder and wasn’t as hung up on picking a more “famous” name at that point in the draft. Unlike in 2017, I liked who they got in the rounds 3-6 area, and I think they may have a real player in 10th round senior sign Carson Shaddy. In the rounds 11-20 they got a number of weekend starters from good schools to sign for the $125k figure, one of which has already forced his way to be twice-promoted. Of course, when nearly half your draft dollars go to one kid, and that kid is a high schooler who probably is playing in our minor leagues for the next 5 years … its going to be quite a while til we really know if this was a winning class or not. The big misses here of course are the 12th and 17th rounders from South Carolina, both of whom announced on twitter within a few minutes of each other of their intent to return to school. 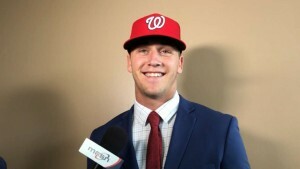 19th rounder Zach Linginfelter was a draft-eligible Sophomore from Tennessee who made it into their weekend rotation late in the season and had the easy decision to return to school, where he probably is a weekend starter all next year and could easily find his way into the top 10 rounds. 2 of the non-signees are Juco guys who were a little hard to find info on: Cole Hamilton and Andrew Nardi. Nardi seems to have a committment to go to Arizona; can’t blame him for heading to a good program. Hamilton doesn’t even have a perfectgame.org profile and too common of a name to research on twitter. No major misses; highest non-signed player was a 12th rounder.